Open-source project that's a perfect cure for insomnia. Wikipedia is known to have its share of gaffes. It is, after all, a user-edited and crowd-sourced encyclopaedia. Those actively involved in the project are accustomed to long discussions, talk-backs, deletions, additions, and the chaos that comes with improving raw entries. To make the experience less stressful, there is a new service called Listen to Wikipedia. Developed as an open source project, a blog post on Hatnote explains how the service works. Any addition to entries are denoted by ringing of bells, whereas the strumming of guitars indicates subtractions. The website employs visual cues as well. If you refer to the image below, the green circles represent edits by anonymous users, purple ones bots, whereas the whites denote registered users. 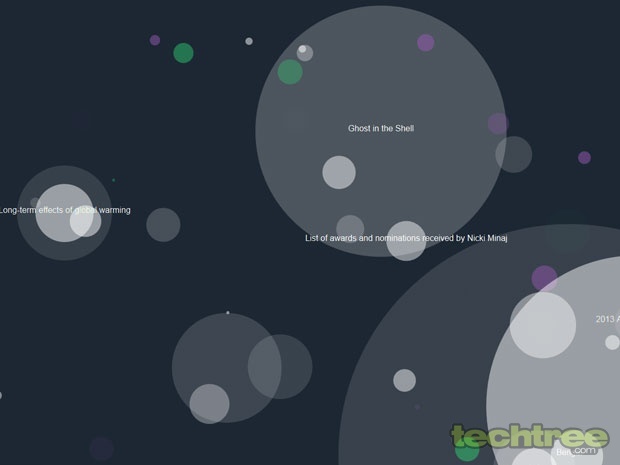 The size of the circles is directly proportional to the amount of edits rendered to an article. Even if you aren't big on keeping the site factually correct, this new service can be a good sleeping aid, as suggested by the good folks at TheVerge.